If you need some extra help getting into your Wrangler JL but also are looking for added side protection then look no further. N-Fab's Predator Pro Nerf Steps give you a drop down step to access your Jeep while also providing wheel to wheel protection while you are out on the trails. This one-piece fully welded aluminum design will give your Jeep a rugged off-road look while serving a purpose as a side step that offers side panel protection. Construction: Made from aluminum for light weight, but heavy duty protection, these side steps are coated in a textured black powder coat to protect against corrosion. Design: A fully one-piece welded design for amazing strength that is light weight. 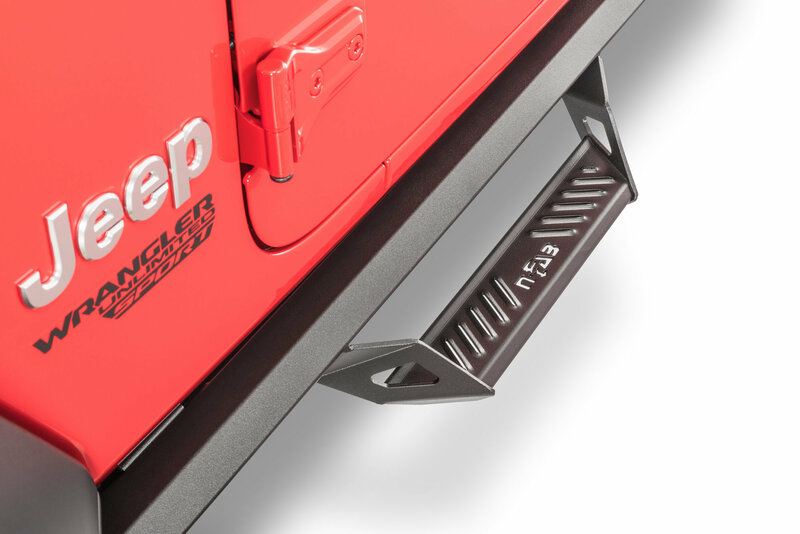 These bars feature a drop down step that has dimples for added traction giving you a slip free surface to step on to access your Jeep. Sit tightly to the body of your JL for a nice off-road look with wheel to wheel protection. Installation: N-Fab makes it a breeze to add these to your Jeep with the provided hardware. There will be no drilling or cutting needed as these bolt right into the factory holes.